NASUBI Mt. Fuji Backpackers is located in Fuji City, at the base of one of the most iconic mountains in the world, NASUBI Mt. Fuji is the perfect venue for your mountain experience. You will enjoy our iconic traditional Japanese home with a fully equipped kitchen, comfortable terrace, cozy living spaces and a great view of Mt. Fuji on clear days. 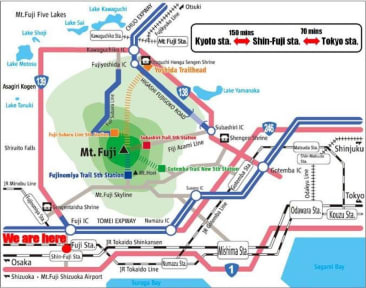 Our convenient location is only a 9-minute walk from Fuji Station (local train and bus station) and 15 minutes from the Shin-Fuji Station (Shinkansen). We provide a free shuttle pick up and drop off for all guests. We are within a short walk to grocery markets, convenience stores, supermarkets, restaurants and the Town Center. You will also enjoy easy access to sightseeing around the area. Play well. Rest well. At NASUBI Mt. Fuji Backpackers, we are here to help you enjoy your Fuji experience. 1. Check-in Time: from 16:00 to 22:00. 2. Check-out Time: from 07:30 to 10:00. 3. Payment: Cash (JPY) or Credit card (Visa, MasterCard or AMERICAN EXPRESS) upon arrival. 5. Age Restriction: Children under 12 years old are not allowed in the dormitories. (1) A child under 3 years old is free to stay unless using own bed. (2) Children over 3 years old are charged the same price as adults. (3) We do not accept someone under 16 years to stay in dormitory. 7. Reception Hours: from 07:30 to 10:00; from 16:00 to 22:00. 9. Pets are not allowed. 10. Parking a car costs 500JPY/night. Monte fuji si vede aprendo la porta. Ambiente accogliente, pulito. Il proprietario gentilissimo e super disponibile. Anche per venire a prenderti in stazione.